Economic Sociology; Ethnography; Sociology of Finance; Neoliberalism; Markets and Consumption; Sociology of Money; Latin America. Daniel Fridman is Assistant Professor in the Department of Sociology and the Lozano Long Institute of Latin American Studies at UT-Austin. He received his PhD in Sociology from Columbia University, where he was a Mellon Fellow at the Institute for Social and Economic Research and Policy. Before joining UT-Austin in 2013, he taught at the University of Victoria and was a fellow at the Centro de Estudios Sociales de la Economía (CESE), Universidad Nacional de San Martín. He previously studied sociology at the University of Buenos Aires and worked for the National Statistics Institute in Argentina. Daniel is interested in the intersections of economy and culture, neoliberalism and financialization, economic policy in Latin America, consumer culture, gift-giving, the sociology of money, and the construction of economic subjects. His book Freedom From Work: Embracing Financial Self-Help in the United States and Argentina received Honorable Mention for the Best Book Award 2016-2017, given by the American Sociological Association Section on Consumers and Consumption. Consumption is at the same time an economic, political and cultural phenomenon. During the twentieth-century and the beginning of the twenty first, in many parts of the world the promise of extending mass-consumption became a central part of political discourses about the rights and benefits of citizens. In Latin America, the goal of achieving a vibrant internal consumer market was conflated by many with the idea of development, progress, and modernity. Conceptually, consumers have been seen alternatively as the sovereigns of markets, as victims of manipulation, or as a locus of resistance and expression. In this course, we will study the place of consumption in social, economic, and political relations in Latin America. We will read recent literature from various disciplines (sociology, history, anthropology, etc.) on consumer culture in the region, with a special focus on Argentina, Chile, Mexico and Brazil. We will deal with a variety of topics and consumption goods, including consumer policies, popular consumption, advertising, neoliberal consumption, middle class consumer culture, home appliances, jeans and tupperware. Students are expected to attend all classes and complete all assigned work, are responsible for ensuring they are properly registered in all their courses, and that they have officially dropped any courses which they do not plan to include in their program. All written work will be graded on the quality of content as well as writing skills. This class introduces students to the study of the intersections between economy and culture. ster. Gift-giving seems to be at first sight a trivial topic for sociology. Like many other phenomena that happen in our everyday life, gifts appear to vanish into what Erving Goffman once called the ‘dust’ of social life. Yet, the gift is a true mystery that social scientists are still trying to uncover. Why and how do we give and receive gifts? Is a gift an act of pure generosity? Do you think of gifts received before giving one? The latter question brings up a set of more uncomfortable questions: Is a gift a simple act of exchange? What is the difference between a gift and a mercantile exchange? Our answers to the questions above will lead us to explore some of the core issues that sociology has dealt with: social organization and social structure, social norms, the relation between individual and society, the nature of economic and non-economic exchange, reciprocity, obligation, cultural meanings and power, among others. Our answers will have an impact on our ideas of who we are: Are we altruistic and generous? Are we selfish and self-interested? What are the conditions under which generosity and self-interest work or do not work? These questions have also timely political relevance. With the recent expansion of neoliberalism, market arrangements based on rational and self-interested individuals have been posed as an efficient and desirable form of organizing social life in various realms. An exploration of the nature of gift-giving and its workings in current contexts may help us evaluate those neoliberal claims and explore alternative arrangements. The readings will take us from pre-modern to current societies; from the potlatch in Western Canada to understanding who pays for dinner or drinks; from the decoration of gifted money to charity and philanthropy; from economies of care to organ and blood donation; from garage sales to State Diaspora bonds; from expressing gratitude to tipping. I expect that, in our discussions, we will broaden even more the repertoire of social phenomena that involves some form of gift-giving. Marcel Mauss, The Gift: The Form and Reason for Exchange in Archaic Societies, W.W. Norton, 1990 . Jacques Godbout and Alain Caille, The World of The Gift, McGill-Queen’s University Press, 2000. Kieran Healy, Last Best Gifts: Altruism and the market for human blood and organs, University of Chicago Press, 2006. Michael Sandel, What Money Can’t Buy: The Moral Limits of Markets, Farrar, Strauss and Giroux, 2012. The course introduces students to some of the main sociological theories and theorists since the late 19th century. The main focus of the class (about two thirds of the semester) will be on three classic authors: Karl Marx, Emile Durkheim, and Max Weber. In the last part of the semester, we will cover selected sociological theorists from the second half of the twentieth century, including Alfred Schutz, Erving Goffman, Pierre Bourdieu, Bruno Latour and Dorothy Smith. My goal is to introduce you to interesting and imaginative authors that took great pains to answer tough questions about society. Some readings will be more difficult than others, some will be more fun than others, and you will be more interested in some readings over others. But all of them will be worth your effort, as they will provide you with a solid grounding in the core theories that have informed sociological thinking since its beginnings. However, of course not everything about theory is reading; a great deal of your work will be thinking “theoretically”. I think that theories are a bit like play dough. They have a defined shape, but they can also be stretched, reshaped, and combined with other pieces. The final shape will not always satisfy you, but you can always start over. So, our goal will be to understand the theories by “playing” with them and relating them to what we usually call the “real world” (although ‘one’s world’ is not the same as the ‘real world’). Eventually, I hope you will discover how powerful and useful sociological theories can be to help you answer some of the toughest questions about societies. Most readings will be in a course packet, in addition to two or three books TBA. This graduate seminar invites students to critically examine and discuss the role of the market in contemporary society, both from a theoretical point of view and empirically in the case of Latin American societies. Development in Latin America and elsewhere in the last few decades has been intertwined with the idea that markets should have a more prominent role in societies. This is a distinct feature of neoliberalism, although it partly continues longer term trends. The readings will be for the most part structured around three perspectives, each of which will be explored first theoretically and then as it is used in empirical research about Latin America. The first perspective emerges from the work of Karl Polanyi, and it basically examines the historical effects of markets when disembedded from society. The second perspective comes from the work of Michel Foucault, particularly his late period, and other scholars that consider neoliberalism as “governmentality” and markets as a technique of government in contemporary societies. Finally the third perspective comes from the work of Viviana Zelizer, who considers the role of culture in reclaiming markets and money and creating meaningful social exchanges. This graduate seminar invites students to critically examine and discuss the role of the market in contemporary society, both from a theoretical point of view and empirically in the case of Latin American societies. Development in Latin America and elsewhere in the last few decades has been intertwined with the idea that markets should have a more prominent role in societies. This is a distinct feature of neoliberalism, although it partly continues longer term trends. The course, therefore, focuses on the relations between markets and society in the context of neoliberalism. The readings will be for the most part structured around three perspectives, each of which will be explored first theoretically and then as it is used in empirical research about Latin America. The first perspective emerges from the work of Karl Polanyi, and it basically examines the historical effects of markets when disembedded from society. The second perspective comes from the work of Michel Foucault, particularly his late period, and other scholars that consider neoliberalism as “governmentality” and markets as a technique of government in contemporary societies. Finally the third perspective comes from the work of Viviana Zelizer, who considers the role of culture in reclaiming markets and money and creating meaningful social exchanges. Readings Most readings will be in a course packet, in addition to two or three books TBA. This graduate seminar examines debates about development in Latin America from the 19th century to today. The course will cover successive development paradigms in the region, from export oriented, import substitution industrialization, neoliberalism, to postneoliberalism. We will pay special attention to theoretical debates and empirical research about the role of markets and economic expertise in Latin America’s development and in society more generally. The course introduces students to some of the main sociological theories and theorists since the late 19th century, including classic (Karl Marx, Emile Durkheim, Max Weber), mid-century (Alfred Schutz’s pehnomenology, Harold Garfinkel’s ethnomethodology, Erving Goffman, Western Marxism), and late twentieth century (Pierre Bourdieu, Bruno Latour, Dorothy Smith). My goal is to introduce you to interesting and imaginative authors that took great pains to answer tough questions about society. Some readings will be more difficult than others, some will be more fun than others, and you will be more interested in some readings over others. But all of them will be worth your effort. However, not everything about theory is reading; a great deal of your work will be thinking “theoretically”. I think that theories are a bit like play dough. They have a defined shape, but they can also be stretched, reshaped, and combined with other pieces. The final shape will not always satisfy you, but you can always start over. So, our goal will be to understand the theories by “playing” with them and relating them to what we usually call the “real world” (although ‘one’s world’ is not the same as the ‘real world’). Eventually, I hope you will discover how powerful and useful sociological theories can be to help you answer some of the toughest questions about societies. Latin American Studies 381 (Topic: Proseminar: Latin America in the Twentieth Century) and 384 may not both be counted. Prerequisite: Graduate standing in Latin American studies. This class introduces students to the study of the intersections between economy and culture. Specific Topics may vary by semester. Fridman, Daniel (2016). 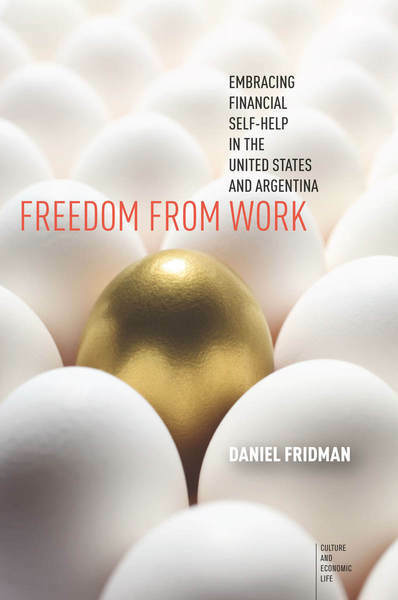 Freedom From Work: Embracing Financial Self-Help in the United States and Argentina. Stanford, CA: Stanford University Press. Fridman, Daniel and Alex Luscombe (2017). “Gift-giving, Disreputable Exchange, and the Management of Donations in a Police Department”. Social Forces, 96(2), pp. 507-528. Fridman, Daniel (2018). “¿Cuánto vale la neurosis? : el pago por la terapia en la ciudad de Buenos Aires,” in Wilkis, Ariel (ed. ), El poder de (e)valuar. La producción monetaria de jerarquías sociales, morales y estéticas en las sociedades contemporáneas. Buenos Aires and Bogotá: UNSAM Edita/Universidad del Rosario. Fridman, Daniel (2017). Betting on Other People’s Lives, Public Books, December 13. Fridman Daniel (2016). "Cashflow: Juego, autoayuda financiera y producción de sujetos económicos", Apuntes de Investigación, Nº28, pp. 69-94. Fridman, Daniel (2015) “Las contradicciones de la gubernamentalidad neoliberal: reforma financiera, nuevos sujetos económicos y crisis en la última dictadura argentina”, pp. 115-134 in Wilkis, Ariel & Alexandre Roig (eds. ), El laberinto de la moneda y las finanzas. La vida social de la economía. Buenos Aires: Biblos. Fridman, Daniel (2014). “Resisting the lure of the paycheck: Freedom and dependence in financial self-help”. Foucault Studies, No.18, pp. 90-112. Fridman, Daniel (2010). “From Rats to Riches: Game Playing and the Production of the Capitalist Self”, Qualitative Sociology, Volume 33, Issue 4, pp. 423-446. Fridman, Daniel (2010). “A New Mentality for a New Economy: Performing the Homo Economicus in Argentina (1976-1983),” Economy and Society, Volume 39, Issue 2, pp. 271-302. Fridman, Daniel (2008). “La creación de los consumidores en la última dictadura argentina,” Apuntes de Investigación, Nº14, pp. 71-92. Fridman, Daniel and David Sheinin (2007). “Wild Bulls, Discarded Foreigners, and Brash Champions: U.S. Empire and the Cultural Constructions of Argentine Boxers,” Left History, Vol. 12, Nº1, Spring/Summer, pp. 52-77. Fridman, Daniel and David Sheinin (2007). “Toros salvajes, extranjeros descartados y campeones insolentes: Estados Unidos y la construcción cultural de los boxeadores argentinos”. Apuntes de Investigación, 13 (2008), pp. 178-205. Sheinin, David and Daniel Fridman (2006). “The Last Champions: Boxing, Violence, and American Cultural Influences in 1970s Argentina,” Latin American Essays, XIX, pp. 79-96. "Economic Sociology in Argentina" (with Ariel Wilkis), Newsletter of the ASA Economic Sociology Section. "Price Gouging has its defenders, but they ignore morality", Dallas Morning News. "Does Being Rich Equate Being Smart? ", Dallas Morning News. "Candidato Rico, Votantes Pobres", La Nación. "Notion that Wealth is a Reflection of ‘Smarts’ is Wrong", The Austin American-Statesman. “The Trumpman Show,” Revista Anfibia. “Elecciones presidenciales en Estados Unidos: El circo de las primarias,” Revista Anfibia. “El soccer es un deporte estúpido,” Revista Anfibia (with Gabriela Polit Dueñas).